[Prototype] – Some UX and Usability thoughts. 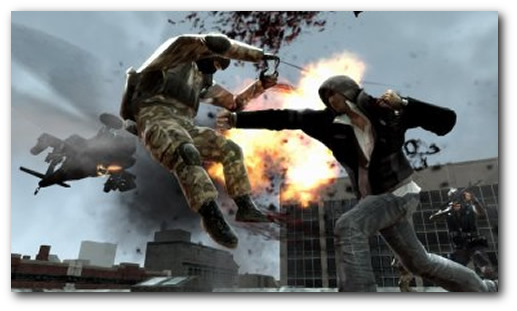 [Prototype] is an open-world superhero action game, released in 2009 which has striking similarities to the game Infamous. As part of my commitment to being a cheap gamer, I recentely picked it up second hand, and have just finished the story mode (aside from the comprehensive list of side missions, but I can never bring myself to go back to them after the story’s completion). Today I’ll share my thoughts on the usability and user experience aspects of the game that worked, and those which didn’t. It’d be fair to say Prototype is an ‘average’ game, having received 78% on metacritic (it’s sad that this counts as average, but that’s inflated review scores for you!). It does some things fantastically, and obviously has sold well enough for a sequel to be in development. So, what impressed me? Relatively early on in the game, the player gets the ability to glide, with subsequent upgrades increasing their potential mobility while in the air. The glide ability is successful in both appearing in-context of a superhero game, and allowing the player to navigate the game world quickly and reach destinations in an appropriate time. By giving the player great freedom of mobility, this reduces the time between the player’s missions, prevents the game feeling ‘sluggish’ and avoids issues with difficult navigation that have been found in many open-world games. As an anti-hero, the protagonist of Prototype, Jim SomeGuy, has a habit of eating people. The ability to gain health by eating NPCs works in the context of the game, and ensures that the player is never ‘stuck’ without the ability to gain sufficient health to complete their mission, due to the prevalence of both enemies and civilians. As a method of healing the player, it is less dependent on suspension of disbelief than a shower of health packs, and more unique than the health regeneration seen in many modern games. However eating an NPC requires the player to stand still, often making it impossible to heal while being ganked by enemies – I’d query this design decision, since it significally heightens the game’s difficulty. As in many games, progress in missions gives you money to upgrade your abilities. However when upgrading the player’s abilities through the in-game menus, the upgrade structure is unclear, both in its UI and its execution. When abilities (such as the ‘overdrive’ ability) are dependent on other skills to be useful (i.e. it must be partnered with specific other powers), this is not indicated and allows the player to buy a potentially useless ability. When purchased, the execution of new abilities is taught through a description of what buttons to press, lacking crucial information on timing and context of successful activation. A minor annoyance is the range of UI issues in the menu presented on start-up. Prior to loading the main menu, the game requires the player to press to continue past a pop-up dialogue – a needless delay. The menu also highlights ‘New Game’s as the first option, despite the use-case for ‘Load Game’ being a lot more common. The game knows if you have a saved game, and could highlight the appropriate option automatically. Minor annoyances like this are an easy fix, and should have been picked up during development. 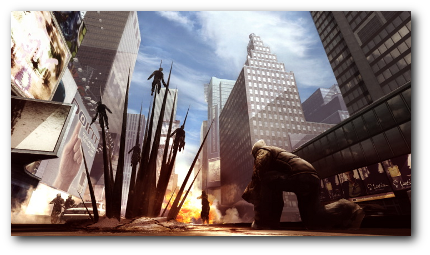 Prototype has a huge amount of potential, and is undoubtedly fun to play. Compared to other open-world games I’ve played, it seems to have extensive variety and some unique game mechanics, such as eating people to disguise as them, which help to keep it compelling . However, a number of small issues with the UI let it down, and detract from the player experience. More extensive user testing, throughout the development process, would pick up these ‘quick-wins’, and could knock the game’s metacritic score into the 80s or above!